The Asda Foundation has donated £30,000 to St Andrew’s Hospice. The grant will fund the kit out of a three bedded room in our newly refurbished inpatient unit. The reconfigured Hospice now has 21 single rooms and three multi-occupancy rooms, all with en-suite facilities. It also includes many features to ensure patients continue to receive quality, person-centred care at the end of life such as over-bed hoists, integrated oxygen and access to the courtyard garden as well as practical features to aid care. Fresh, modern design and décor with flexible heating and better lighting are key aspects of the room design. All of the public spaces have also been upgraded and fitted out with new fixtures and fittings which will add to the comfort of our patients, their families and visitors to the Hospice. The Asda Foundation gives grants and supports relevant projects throughout the UK helping charities and local good causes, all making a difference to the local community. 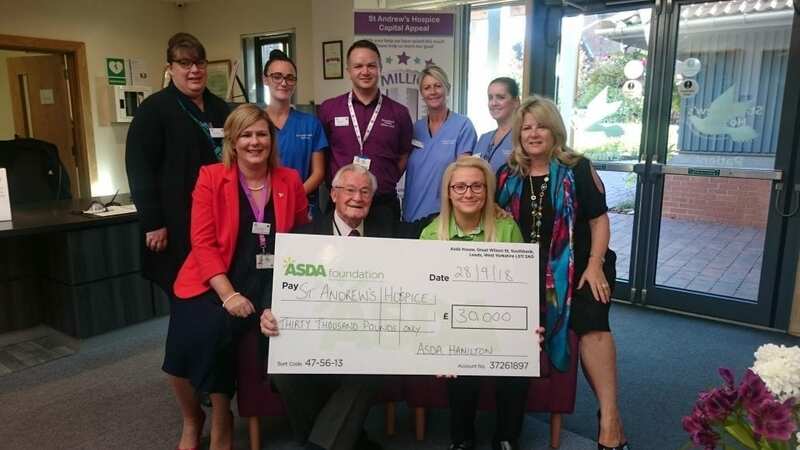 Emily Harrison, Asda Foundation Manager said: “The Asda Foundation trustees were delighted to support St Andrew’s Hospice with a Significant Local Impact grant of £30,000. The Foundation always aims to support local projects that are making a real difference in the communities in which we serve. It is truly remarkable the amount of work the Hospice has done and we are proud to support this vital service in partnership with Hamilton Asda and Kimberly Keys, their Community Champion.